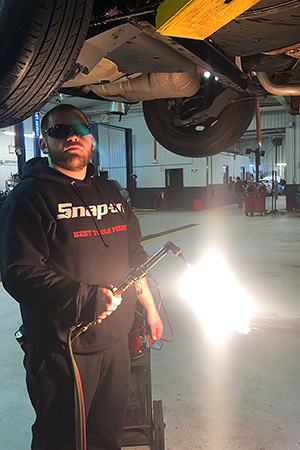 West Windsor, N.J. – Charlie Eosso ’18 (A.A.S., Automotive Technology) already knew his way around cars when he was still in high school and worked part-time as an automotive technician. Fast forward just a few years, and Charlie is an ASE master technician working at Route 33 Nissan in Hamilton. While studying automotive technology at Mercer County Technical Schools, he heard from two of his teachers that Mercer County Community College (MCCC) was the place to continue to grow as a technician and student. He got the same message from a former co-worker who graduated from MCCC’s Automotive Tech program. Add the fact that Mercer was close to home, affordable, and would allow him to continue working in the industry. The choice for college was obvious. Eosso enrolled at MCCC in 2016 directly after high school. “I decided to pursue a college degree. The people I knew in the field with degrees were employed at a higher level, including as foremen. Getting your associate degree enables you to go further in your career and prepares you for transfer if you want to get a bachelor’s degree,” Eosso said. Eosso did an admirable balancing act, attending MCCC full-time and working mostly full-time, first at Windsor Nissan on Route 130 and then at Route 33 Nissan. Eosso has nothing but praise for the Automotive Technology program. He appreciated the small class sizes and personalized attention. “We worked in small groups. The faculty was good at answering questions and making sure everyone understood the material,” he said. Eosso recalls that the curriculum was designed so that no one fell behind. “We had a test every Monday that covered the chapter from the previous week. It forced us to keep up,” he said. He also appreciated the state-of-the-art equipment in the Automotive Technology Lab. “In our industry, we are using computers more and more for diagnostics. All that was available to me. I would learn things at Mercer that I could apply on the job and vice versa. The two really complemented each other,” he said. Eosso studied in MCCC’s Comprehensive Automotive Program. (Students may also enroll in the Mopar Career Automotive Program, sponsored by Fiat Chrysler Automobiles, or Subaru University, sponsored by Subaru of America.) “Professor [Jason] Evans made sure that we got an understanding of how all the systems work,” he noted. Eosso says the program’s required internship is essential. “That’s part of what makes Mercer’s program so good. By the third semester, you can’t sign up for classes unless you have an internship. My job served as my internship,” he noted. Eosso advises students to do their homework when selecting an automotive program. “When you look at schools, make sure you know what you are getting. Mercer is a solid education that you can trust,” he said, adding that your schoolwork and training leads to an associate degree. Eosso says another great outcome of his Mercer years were the friendships he made. “We remain in touch,” he said, recalling the class days when he and his fellow students would take lunch breaks and play ball on the field in front of the Automotive Technology building. “These days, they are working at dealerships all over the area. Name any dealership, and chances are there is a Mercer grad working there,” he said.